This popular 11" glass Proof & Tralles hydrometer is designed to test the alcohol volume in distilled spirits. Scales read from 0% - 100% alcohol by volume and also from 0 - 200 proof. Alcohol volume is exactly half of the proof. For example, an 80 proof liquor is 40% alcohol by volume. If you are making moonshine, this is the "proofer" you need. A Proof and Tralles Hydrometer is designed to test 'pure' distilled spirits such as whiskey, vodka & moonshine. It is not meant to be used with liquors that have high concentrations of sugar or other ingredients such as homemade Rums, cordials, liqueurs and flavored liquors like Peach Brandy or Apple Pie Moonshine. 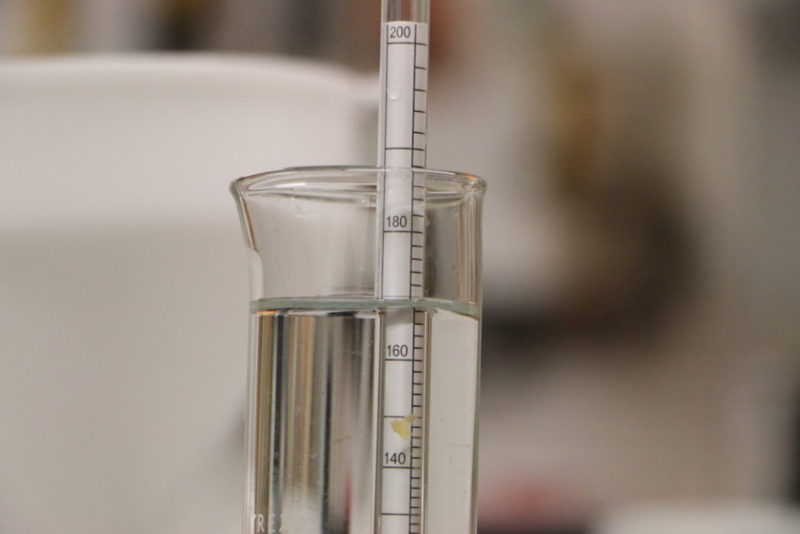 Alcohol concentration will not test accurately after the flavorings are added because flavorings create buoyancy to the solution that will skew the hydrometer reading. HOW TO GET THE PROOF OF AN ALCOHOL WITH RESIDUAL SUGARS: Test the completely fermented and distilled product with a Proof and Tralles Hydrometer PRIOR to the addition of the flavorings. Also, measure the volume of liquid before adding the flavorings (alcoholic ingredients) as well as the volume of the flavorings (non-alcoholic ingredients.) CLICK HERE to enter each of these figures into our online Excel calculator and you will get the final alcohol percentage (ABV) and Proof. Pretty cool, huh? ARE YOUR BARTENDERS WATERING DOWN YOUR PROFITS? In bars where managers take inventories, bartenders sometimes add water to liquor bottles to cover up pilferage and free drinks. It's a good idea to spot check your establishment's bottles to keep from being fooled by devious employees. Every order comes with instructions and a protective sleeve to store the hydrometer. * DON'T FORGET THE TEST JAR! The test jar is a tall, straight-sided clear cylinder that holds the small sample of alcohol to be tested. The hydrometer sinks straight down into the distilled spirit and the test jar keeps the hydrometer upright. The alcohol volume readings are easily taken by looking through the side of the test jar. Order 1 test jar and get 5% off your entire hydrometer order. Order 2 test jars and we'll knock 10% off the entire order! Click here for hydrometer instructions. Click here to view the temperature conversion chart. Don't be fooled by very low priced hydrometers or test jars you find advertised on the internet. Those are cheaply manufactured and will not provide the accuracy or longevity that you will get with our products. You get what you pay for. Our hydrometers and test jars are top-of-the-line quality and every purchase is backed by our 30-day Satisfaction Guarantee.